Everyone loves a party and residents at La Harpe Davier Health Care were no exception. 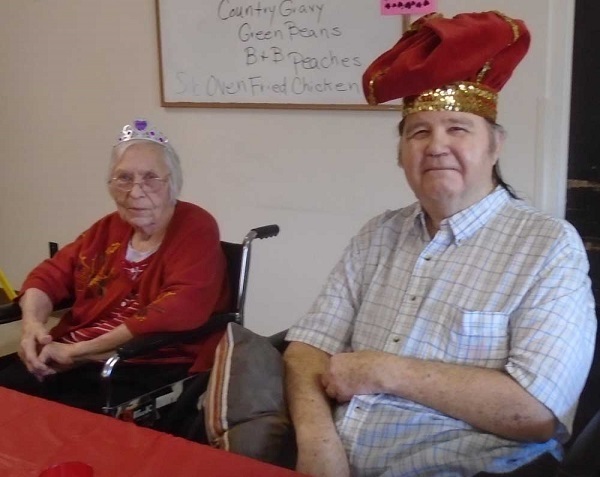 In fact, residents were all given a royal welcome as they were entertained at the annual Davier Valentine's Party last Tuesday, February 14th. It was a sweetheart of a deal for the 2017 Valentine King and Queen Mr. Edward Lionberger and Ms. Jane Carter who were selected as this year's royal sweethearts and escorted to the head of the table. They were even crowned for the day with a special "royal" crown and tiara. The "loving" staff members were sweethearts too, as they served sweet cookies that were baked especially for the residents and holiday beverages with assorted candies spread out on a table decorated with a festive Valentine themed tablecloth. A special concert of music for all the sweet residents was presented by Kathy Spiker and Sarah Smith which brought to the party a lively and romantic flare for a Valentines party. Residents felt special, which all agreed they were, and they appreciated the regal affair. A jovial time was had by all.